If you don’t count the spritz cookies Zeb and I made just before Thanksgiving, these Scandinavian Rosettes are the first Christmas cookies of the season for me. Growing up my mother called these kruschiki’s, but when I did some research to find a recipe for them, the recipes for kruschiki’s looked nothing like these deep-fried rosettes. The recipe is simple and takes only minutes to make. Whisk eggs, sugar extract and milk together. Add flour and salt and beat till mixture is smooth. Heat 2 – 3″ of oil in deep fryer to 360. Submerge rosette iron into the oil to heat. Pour batter into shallow bowl that is wide enough to submerge entire iron. Dip the heated iron into the batter, careful not to cover the top. Dip batter-covered iron into oil, submerging. 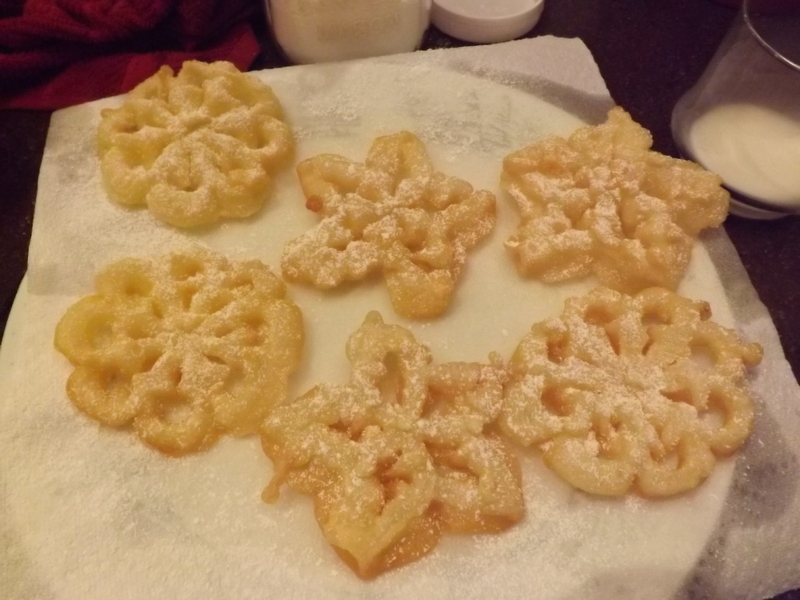 Allow rosette to fry until golden brown, using a knife-edge to scrape off any excess batter from top if necessary. These cookies are light and go down easily. The only change I might try when I make these again is to add some vodka to the batter. This is an old Polish trick to stop the batter from soaking up oil when they are deep-fried. I’m not sure how much I would add, but it burns off while frying anyhow, so I’m not sure it matters. I wish I had time to bake a different cookie every day of December, but time just doesn’t allow. Today was the first of my more realistic goal of a dozen different types of Christmas cookies, and for this I am — Simply Grateful. the ingredients sounds simple but they look so ornate! I really wish I could taste these. They are so light, it’s hard to keep them around for very long, that’s for sure. They really are! Not heavy like traditional Christmas cookies, so it’s a nice way to kick off the season.